AMSTERDAM - Earlier this year, a company called Plastic Whale teamed up with Vepa, an office and project furniture manufacturer in the Netherlands, and LAMA Concept, an agency specializing in sustainable design, to complete a project of circular, corporate furnishings that are made from wood and recycled poly-ethylene terephthalate (PET), or plastic waste. Made from plastic fished from the Canals of Amsterdam, the high-end, debut collection consists of a boardroom table, chairs, lamps, and acoustic wall panels. The inspiration behind all of the company’s designs is the whale. Plastic Whale is a non-profit, professional plastic fishing company in Amsterdam, the first in the world it says, and it combats the problem of plastic soup in the waters of the Netherlands. Plastic soup, a growing global problem, refers to all the discarded plastic that has made its way into the seas and oceans of the world. Plastic Whale says the creature symbolizes the challenge that the company is taking on; it is huge and yet extremely vulnerable to environmental damage, just like the seas. The image of a whale surfacing from the ocean with a visible blowhole is the inspiration for the top of the boardroom table. It is made from layers of recycled PET felt, recycled PET foam, and Forest Stewardship Council (FSC) certified birch wood. 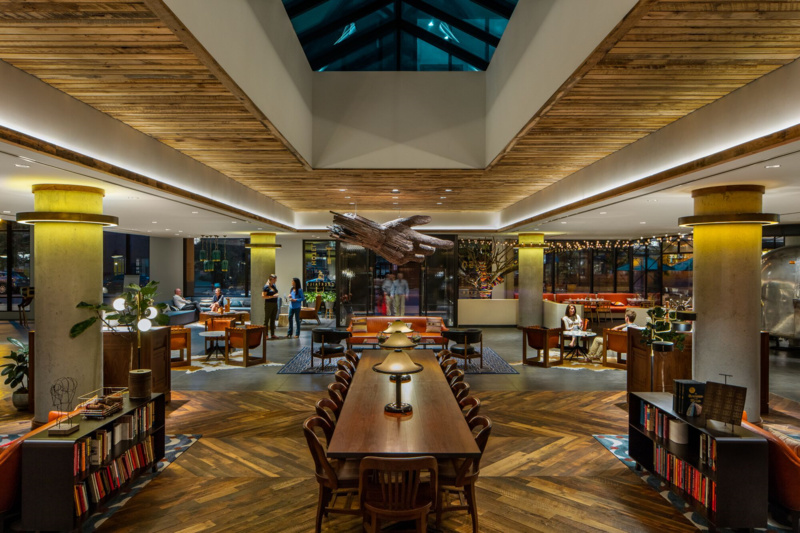 The table’s legs, reminiscent of the whale’s skeleton, are made of FSC oak while the underside of the blowhole is covered with a plywood plate. 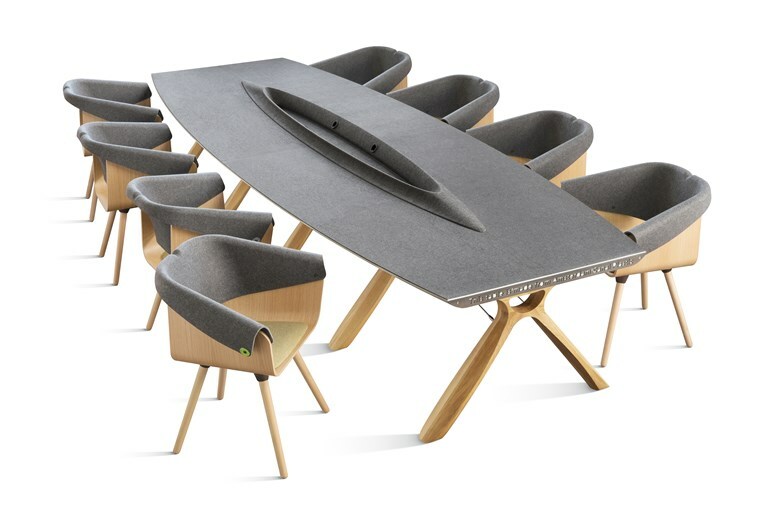 The form of a whale’s tail is the inspiration for the chair. 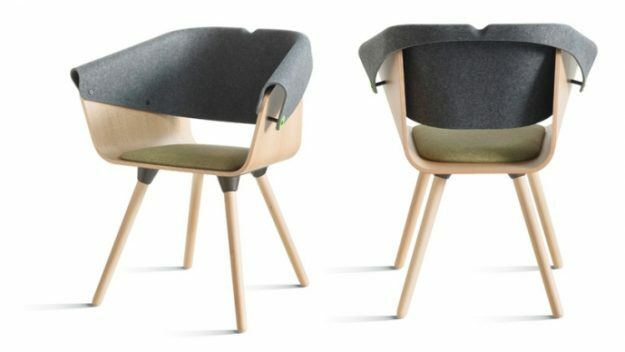 Its cast iron frame is made from steel waste recycled in the company’s factory, its back from pressed felt from recycled PET plastic bottles, and its cushioning from residual fabric. The lamps get their shape from the barnacles found living on a whale’s skin and are cut from one piece of pressed recycled PET felt to ensure no waste during production. Using LED filament bulbs to minimize energy usage, the lamps can be used separately in a number of combinations, or as an installation. Also available are acoustic panels which are inspired by the pleats on a whale’s throat. They are made entirely from pressed recycled PET felt and are available with LED backlighting. Plastic Whale Circular Furniture is created following the full principles of circular production and design, which is a restorative and regenerative approach as opposed to a linear economy. Making sure nothing goes to waste, the company uses recycled steel for chair legs and reclaimed fabrics. 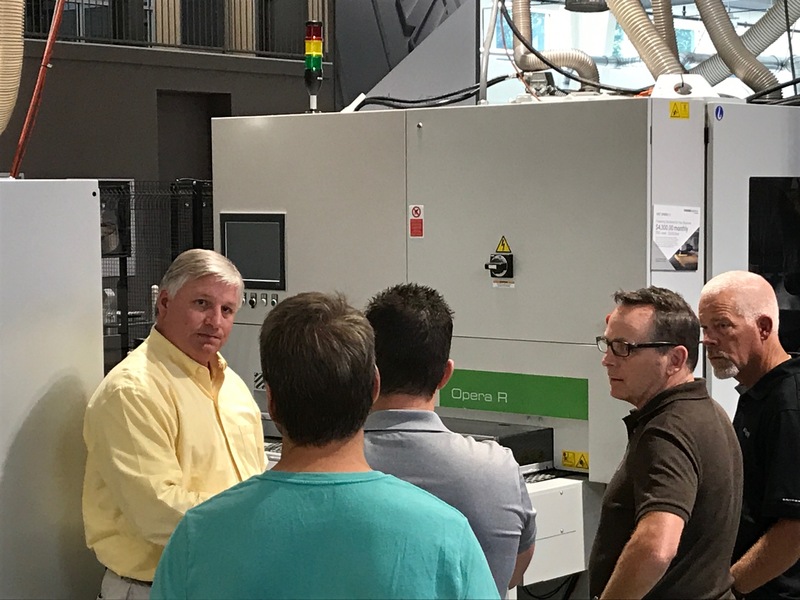 Instead of disposing the product at the end of its life cycle, the company will buy it back from the customer and recycle it again to come full circle. 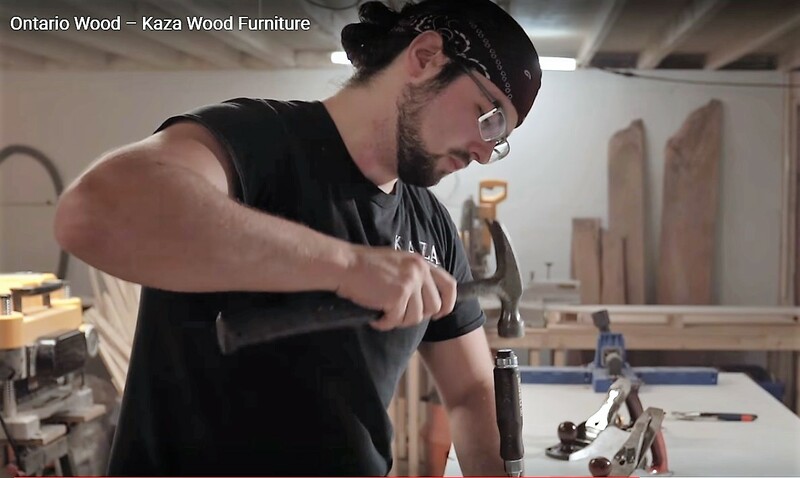 While Plastic Whale is not prominent in the woodworking industry, its recent furniture project is an example of how recycled plastic can be incorporated. 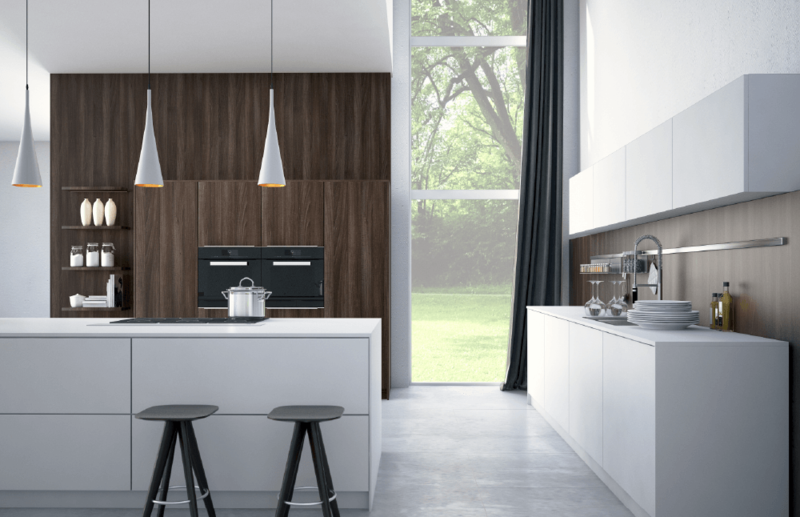 3B S.p.A., an Italian-based manufacturer of furniture doors and components, has recently begun creating panels made from 100 percent recycled PET. From plastic water bottles, 3B S.p.A. creates laminates of recycled PET resin in an effort to contribute to the preservation of the planet’s well-being. The company’s plastic fishing expeditions are considered a social impact experience, which means 100 percent of proceeds from this experience go to Plastic Whale. With the price of a two-hour event, Plastic Whale will build new boats made from the plastic that fishers have retrieved on the expedition. 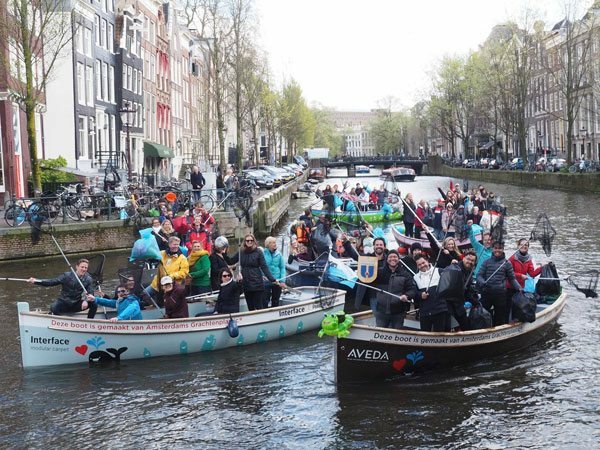 Today, the company has a fleet of ten design boats made from Amsterdam Canal plastic that are used to fish for more plastic. Sign up for an event here. Beginning in 2011 with a single boat, the company’s mission is to make the world’s waters plastic-free and create value from plastic waste by turning it into raw material. By re-using these common materials, the company hopes to make people think differently about single-use plastics and trash. According to the World Economic Forum, estimates indicate that a weight of 150 million tons of plastic is found in the oceans. With 322 million tons of plastics reported to have been produced in 2015, the Forum states that only 14 percent of it is recycled. It is estimated that for every minute, 120,548 plastic bottles end up in either landfills or in the ocean. The company says it turns the thousands of PET bottles it fishes from Amsterdam’s canals into raw materials to create new products. 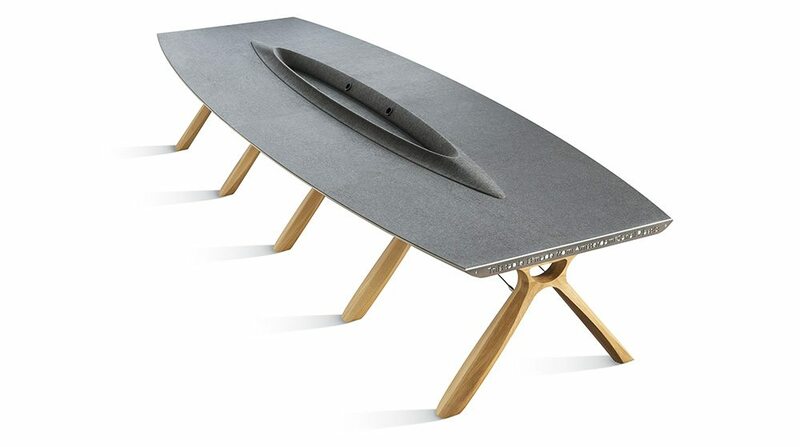 It has created plastic foam which is used to make the company’s boats and tables, and plastic felt that can adapted for various applications found in the company’s lamps, acoustic panels, chairs, and tables.